The Florence 4C Trash and Recycling Centers are designed to match 4C mailbox suites. 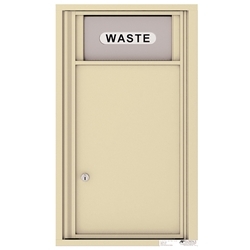 This trash / recycling bin will complement a 4C mailbox installation or act as a stand-alone trash / recycling center. Height: Unit height is 30-1/4"
Width: Unit width is 17-1/2"
Note: Postal Grey is a flat finish; all other colors are a pebble finish. Deposit and collect mail from the front of the unit, which is fully-recessed into the wall. Attractive silver decal 'TRASH' for single compartments.